Welcome to our new 1st Wenvoe Beavers! In October we invested eight new Beavers into 1st Wenvoe's Beaver colony. They all made their promise and were awarded their purple membership badge and welcomed to the group. In just half a term three Beavers have been awarded their 'three nights away' badge and a further four their 'one night away' badge. 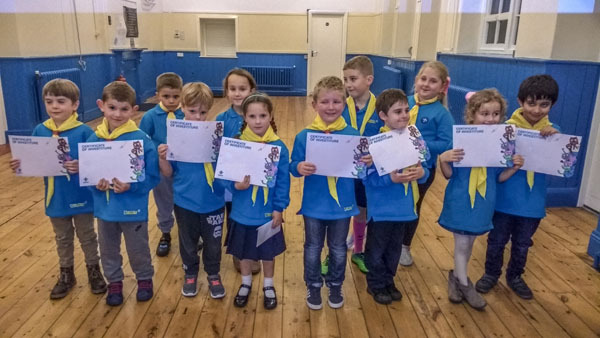 These were for taking part in the summer district family weekend camp and the district Beaver sleep-over, where they completed their 'space' badge. They watched a short video of Major Tim Peake welcoming them, as a new Scout Ambassador. The whole colony were also awarded their 'health and fitness' badge in October. Well done all Beavers, leaders and assistants for your hard work this term!